Gregory the Great (c.540-604) was pope (from 590 until his death), reputed inventor of 'Gregorian' chant, and one of the most important authors of the early Middle Ages. His Commentary on Job is a vast work, running to half a million words, divided into 35 books, and is bound in as many as six volumes. This manuscript contains Books 17-35, and was therefore presumably the second half of a two-volume set that was apparently owned in the Middle Ages by St. Mary's Priory, Bradenstoke (between Swindon and Chippenham). Book XXXIII is introduced by an initial 'S' with animal heads at each end, and is set against a rich blue background. 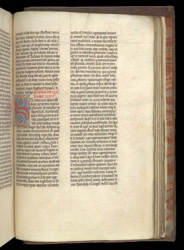 The page layout is typical of 12th-century monastic manuscripts, with two columns of well-spaced text, ample margins, and none of the apparatus intended to help readers, such as running-titles, that would become common in the 13th century.